Many cars now have cup holders. 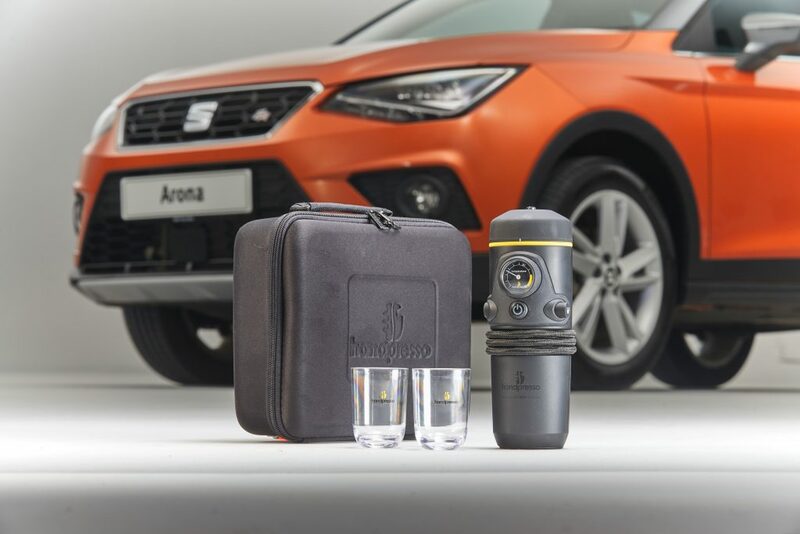 But SEAT, part of the Volkswagen Group, has gone one step further with the introduction of a portable Handspresso coffee machine as an optional extra from all dealerships priced £185. It will fit neatly into the twin cup holders between the front seats in any SEAT model and dispenses 50ml of hot, fresh espresso per use in under three minutes, claims the car manufacturer . SEAT reckons it could save more than £1,800 a year in coffee shop bills and up to an hour and a half in time spent lounging in coffee shops, according to its research. Two in five British motorists say they drink coffee whilst driving and – with the cost of using the Handpresso machine over 12 months estimated at £405 – it could represent a significant saving on the £2,210 spent per year by the nation’s increasing number of coffee connoisseurs. Priced at £185, the Handpresso machine comes with two glasses, meaning users can also help the environment by doing away for the need for take-away coffee cups. An estimated 2.5 billion cups are thrown away in the UK each year. The Handpresso is powered via the 12v plug and drivers can choose to use coffee pods supplied with the machine or refillable sachets of their own coffee, meaning the UK’s ‘coffee snobs’ can enjoy the roast of their choice at any time. Thanks to its packaging, the Handpresso machine fits into a carry bag with its two glasses, napkins and space for spoons, condiments and coffee pods or ground coffee. The carry bag then packs away into the vehicle’s glove box. The Handpresso machine costs £185 RRP if ordered at any SEAT dealership, including a 12-month warranty and 15 espresso pods.